Antoinette Newell was born and raised in small town Alberta. She attended the University of Alberta and graduated with a Bachelor’s Degree in Physical Education. Her love for the small town kept her busy as an athletic trainer for various levels of hockey as well as coaching basketball, volleyball and track and field. Antoinette graduated from the Alberta College of Massage Therapy with Distinction as a 2200 hour Registered Massage Therapist. Antoinette uses a therapeutic approach to her massage treatments, and believes in providing patients with individualized treatments to resolve underlying reasons why they may have pain and dysfunction in their bodies. 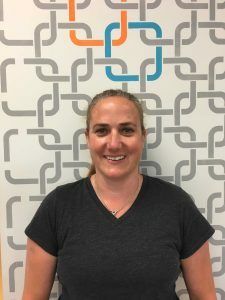 Through the combination of assessment, manual therapy, education and collaboration with other health practitioners, Antoinette will assist you to reach your body’s optimal potential. Antoinette loves spending time with her family and dogs and believes a healthy lifestyle starts outside. Antoinette spends as much time as possible in the mountains either horseback riding, downhill skiing, kayaking, fishing or hiking, just to name a few favorites. Her one indulgence is chocolate ice cream. Copyright © 2015 Complete Chiropractic & Sports Therapy. All Rights Reserved.